Chance encounters often lead us on extraordinary adventures and so tonight's concert came about. 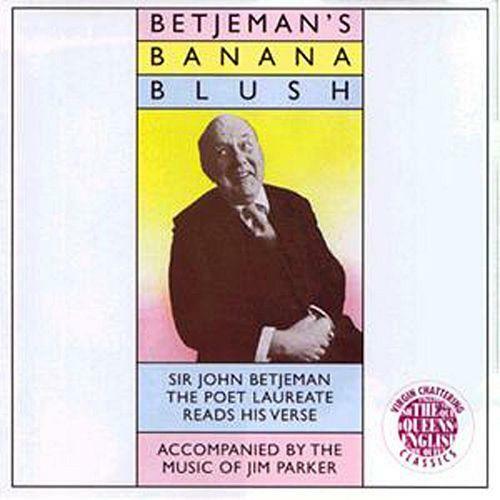 Earlier this year, at the launch of our new recording of Façade I met Edward Wilde of the Betjeman Society and, on the theme of music and poetry, mentioned Betjeman's Banana Blush which I had loved since first hearing the LP many years ago. Three days later I had a call from its composer, Jim Parker. The cult album turned the 67 year-old Poet Laureate into an unwitting Pop Star. John Peel regularly played selections on Radio 1 and modern artists Jarvis Cocker and Suggs credit it with inspiring a generation of British bands like Madness to write, not about well-worn American cliches but about the towns and cities they knew in all their poetic ordinariness. The BAFTA-winning composer, Jim Parker, set Betjeman’s poems to music in 1974 for the same record label that released hits by Monty Python. I visited Jim at home whilst he was busy writing music for the TV series Midsommer Murders, part of a hugely successful career he says he owes to Banana Blush, and asked him how Betjeman felt about the project. Jim showed me his original hand-written score and said Betjeman loved the experience of the recording studio, surrounded by musicians and technicians whose professionalism he greatly admired. Those hand-written scores were until a few weeks ago the only copies, with many parts lost over the years which is why it has been so rarely performed. Jim has recreated those missing pieces especially for tonight's concert and the entire work is to be published for the first time. The same could be said of a live performance and we hope you enjoy this special concert in the magical candlelit atmosphere of St Martin-in-the-Fields.